Goal setting is a very important life skill to develop at a young age. Athletics are a great way to teach and demonstrate the power of goals because kids are often more engaged and interested in sport than they are in learning to multiply. Kids need to be helped through the goal setting process in order to learn how it works. It will likely take many repetitions and tries before a kid will start setting goals on their own. It is a good idea for each athlete to have a goal notebook in which they can write their goals down and write their progress towards their goals. This can also transform into a training log down the road for those athletes that become more involved. Goals need to be broken down. It is a good idea to start with a long term goal or dream goal. Then ask, what do I need to accomplish each year to reach this goal? Each month? Each week? Each day? By having something to focus on and accomplish each day, week, month and so on, it is much easier to remain focused, motivated, and get the most out of each day’s practice session. Goals should be written with both outcomes and process in mind. It is important to have goals about how to approach practice or specific skills as much as it is to have goals on the outcome of a particular event. A process goal is something that focuses on skill building, attitude, or approach. It allows for athletes to grow as individuals, gain confidence, increase motivation, and have greater focus during practice time. The process goals are the small steps that when accomplished will lead to the outcome goals, the long term goals, and ultimately the dream goal. -Goals should always be written in the positive. For example, I won’t be late for practice should be written as I will be on time to practice everyday. - Do you have the resources you need to accomplish your goals? - Is your goal and what you need to accomplish it within your control, if not, can you make it within your control? - Sharing your goals can often help you become accountable and can build a sense of teamwork. Be sure to share goals with somebody. - Accomplishing goals often takes help from others. What resources are available to you that you could be using to help? Write a different goal in each column across the top. Some goals should be ones you come up with and others should be ones you brainstorm as a group. They should include things in all aspects of skiing: equipment, time spent skiing, teamwork, healthy lifestyle, technique skills, etc. The name of each athlete should be in the rows coming down the chart. After each day or during the practice session, athletes can show you how they have accomplished one of the goals, then write the date in box under the specific goal in the row with their name. One good way to do this that mimics proper goal setting is to establish a few broader and more long term goals such as skiing using appropriate technique for the terrain. This obviously requires many smaller steps, including, but not limited to, taking care of equipment, eating enough before practice, learning each skill individually and so on. Then for each day or week, create a chart that reflects the small goals for that day or week that will help eventually get to the big goal. 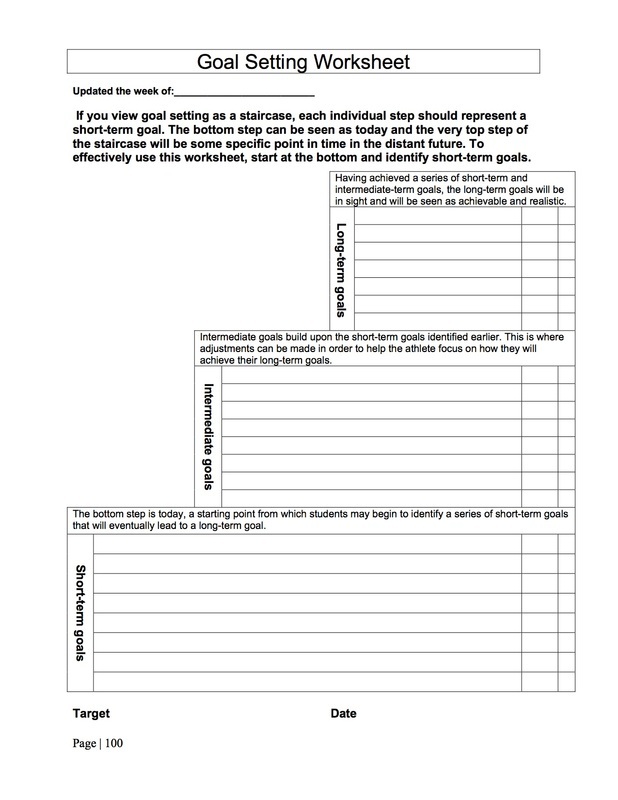 This goal setting worksheet is from the USSA Level 100 Coaches Manual.